Two of Great Britain's Olympic hopefuls have performed in a pool full of plastic to highlight the problem of pollution. 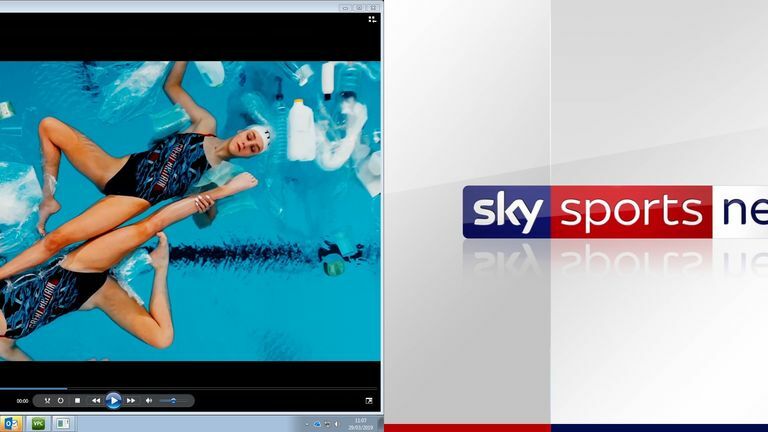 Team GB synchronised swimmers Kate Shortman and Isabelle Thorpe recreate their world championship routine among bottles, carrier bags and toiletries. They hope the video will draw attention to the 8 million tonnes of plastic dumped into the oceans each which seriously impacts marine life. The routine was performed as part of The Big Bang Fair, the largest celebration of science, technology, engineering and maths for young people in the UK. To highlight the way that young scientists and engineers are using their skills to address environmental issues, The Big Bang Fair challenged the swimmers to perform their routine in a pool full of plastic. "I am very inspired by the finalists of The Big Bang Competition who have developed new and innovative ways to tackle the plastics epidemic head-on," said Kate. "There's no doubt that plastic in our oceans is already a huge issue, with consequences on the daily lives of future generations unless we do something about it, so it's fantastic that young people are encouraging people to take responsibility and change their behaviour towards plastics." Kate and Isabelle are currently bidding to qualify for the Tokyo 2020 Olympics.